The TECHT MRT(MASS REDUCTION TECHNOLOGY) HE Pro Series Phenom Bolt has been re-engineered to maximize efficiency and consistency more than ever before! We have continued to use the soft-touch face which will significantly decrease ball breakage. Our MRT system minimizes excess weight by removing portions of the bolt which are not utilized. Our spiral cut pattern allows us to lengthen the channels of material to be removed, the result produces a very dynamic looking bolt. The MRT HE Bolt also features a newly redesigned stem which delivers even better efficiency and consistency than it's predecessor. Players that upgrade to the MRT HE Pro Series Phenom Bolt will see significant increases in efficiency and the elimination of ball breakage typically associated with the stock Phenom bolt. The TECHT MRT Pro Series Bolt is made of a combination of aircraft grade aluminum and delrin which result in a super light design. As with all of our products it carries a Full Lifetime Warranty. The TECHT MRT HE Pro Series Phenom Bolt utilizes the stock spring. In our testing we found that changing to a different spring (a lighter spring) caused issues with the cyclone feed loading correctly. We saw increases of 40-45 FPS when changing out the stock bolt for the MRT HE Bolt. Our tremendous increase in efficiency is due to the combination of the soft-touch face, which helps seal the off the barrel when fired, the tremendous change in weight, high flow face, and our new bolt stem design. The sound signature is also greatly reduced when adding the MRT Bolt. Our New MRT H.E. design utilizes two o-ring glands that act as sails on the interior of the bolt. These o-rings do not actually seal (therefore they will not need to be replaced). They do however maximize the the transfer of air propelling the bolt forward and by doing so allow the MRT HE bolt to get even better efficiency than ever before. The exhaust port on the interior of the stem allows the bolt to cycle freely and quickly. 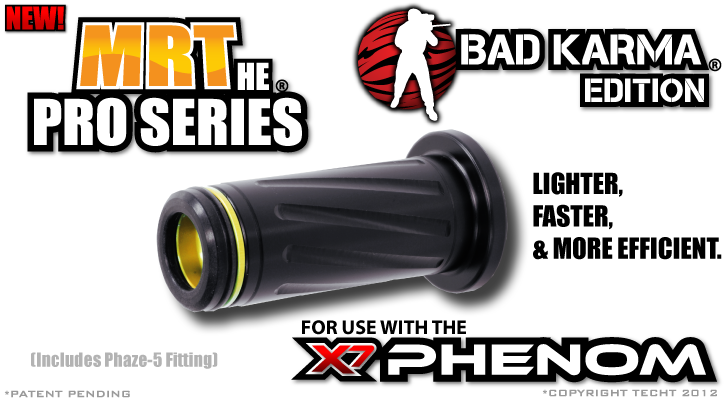 All MRT Phenom Bolts will come with our Phaze-5 Air Fitting for the Cyclone Feed. The Phaze-5 Fitting allows more air to get to the cyclone feed and actuate the paddles more consistently. The TECHT Phaze-5 Fitting is manufactured from stainless steel which makes it a much more durable replacement for the stock plastic fitting. The Phaze-5 Fitting must be installed to allow the MRT Phenom Bolt to work properly in conjunction with the Cyclone Feed System. Please watch our install and troubleshooting video to insure that your TECHT MRT HE Phenom Bolt is installed properly. When the TECHT Pro Series Delrin MRT HE Bolt is combined with our Phaze-5 High Flow Air Fitting, players will be able to run at lower operating pressures and higher rates of fire. The Phaze-5 High Flow Air Fitting allows the Cyclone feed to run more consistently with the extremely lightweight design of the TECHT Pro Series MRT HE Bolt. 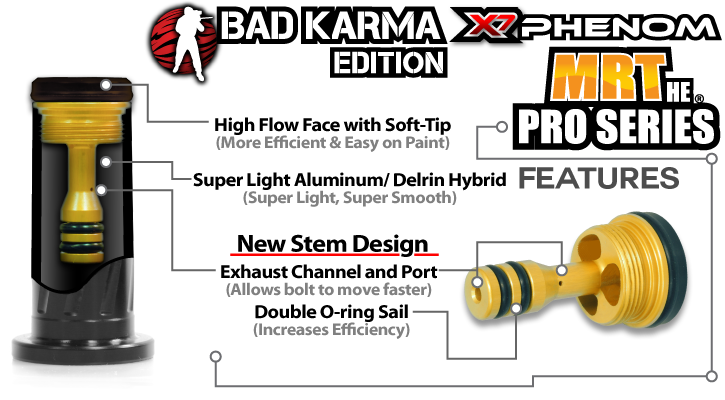 Thanks to Bad Karma Paintball Team for all of their support of TechT Paintball Products. They trust our company to make the best parts for their markers. 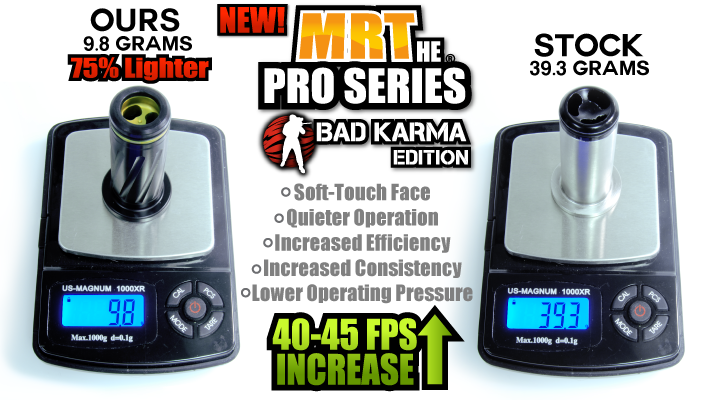 By using the TECHT MRT Phenom Bolt System Bad Karma is cutting down the competition. "The TECHT MRT Phenom Bolt is head and shoulders above the rest. "-Jared Bronson Team Captain of Bad Karma Paintball Team. TechT's MRT Phenom is the best and lightest bolt upgrade you can get for the Tippmann Phenom. This is a must for any Tippmann Phenom owner.